« Secret Videotape of Obama Cabinet Meeting Unveiled! With Crimea potentially breaking away from Ukraine and the ongoing risk of conflict, it’s time to revisit the topic. I explained a few weeks ago that decentralization was one way of defusing the crisis. Now Kevin Hassett of the American Enterprise Institute has a refreshing and important analysis explaining how bad economic policy has hindered Ukraine’s development. He explains that Ukraine was one of the former Soviet Bloc nations that made the mistake of not copying the more market-oriented nations of Western Europe. Prior to the breakup [of the Soviet Empire], Eastern Europe was underdeveloped relative to the West, mostly because of the failure created by central planning. When a market economy is unleashed in such a setting, “convergence” of the standard of living to that of the developed world can be quite rapid. …A large academic literature has emerged analyzing the impact of “going west.” The literature documents that those nations that assimilated into the EU saw dramatic economic growth. …The countries, like Ukraine, that failed to take that path have stagnated. The impact is remarkable. Using EU membership as a proxy for nations that “went west,” Kevin put together a graph showing how the more market-oriented nations have dramatically out-performed the rest. He notes that per-capita income has climbed far faster in the western-oriented nations. Income per capita has grown sharply since the mid 1990s, more than doubling for the former Soviet countries, and increasing about 50 percent for the Eastern Bloc countries (such as the Czech Republic) that have joined the EU. …The three lines on the bottom of the chart depict what has happened to those nations that have not joined the EU. Each of these countries has stagnated, seeing a standard of living that has barely budged since the fall of the USSR. So what’s the moral of the story? Kevin bluntly writes that people who want to affiliate with Putin are traitors because they are condemning their fellow citizens to economic misery. Vladimir Putin’s desire to maintain a zone of influence has had a dramatically negative effect on the economic well-being of citizens of the affected countries. It is hard to imagine how anyone could look at such data and not conclude that Putin supporters outside Russia are traitors, if not to their nations at the very least to their compatriots’ prospects of economic security and prosperity. Now I want to build on what Kevin wrote by stating that “going west” is important because it is a proxy for more economic freedom. Let’s take another look at his chart, but augment it with some numbers from Economic Freedom of the World. I collected both the absolute ranking and relative economic freedom scores for the former Soviet Bloc nations, and then put together averages for each of the categories in Kevin’s chart. The first number is the average ranking and the second number is the average score. As you can see, the nations that have enjoyed more growth are the ones that have the most economic liberty. Time for some caveats. Because of data limitations, the EFW Index does not have numbers for nations such as Kosovo. Moreover, Kevin didn’t include the former Soviet states that are in Asia, and I confess I don’t know for sure whether that means nations such as Armenia and Georgia are excluded. But those issues only influence the green and red lines, and adding or subtracting those nations doesn’t change the look of the graph. That having been said, the real moral of the story is that Ukraine needs economic liberty. It doesn’t have that now, and it almost surely won’t have that if it falls more under Putin’s influence. Why? Because Ukraine already has been practicing Putinonomics (which is a sordid mix of cronyism, regulation, corruption, and weak rule of law), so more Russian control presumably will mean jumping from one frying pan to another. Simply stated, if you want more prosperity, there’s no substitute for free markets and small government. The more nations move in that direction, the richer they will become. what if the Russians were to only accept payment for Russian oil and gas in ruble… yuan… euros… or gold… how would that affect the petrodollar? what if other energy producers followed suit? You killed it with offering up California. Californians might just vote themselves into the Russian federation if we could only get the issue on the ballot. If we consider the corruption load a burden on the economy akin to the burden of government spending, then Russia had it much easier than Ukraine (under both Timoshenko and Yanukovich governments). I saw estimates about 15% for Russia and as much as 30% GDP for Ukraine. It takes a lot of hard work to become worse than Putin’s Russia, but Ukrainians succeeded at that. 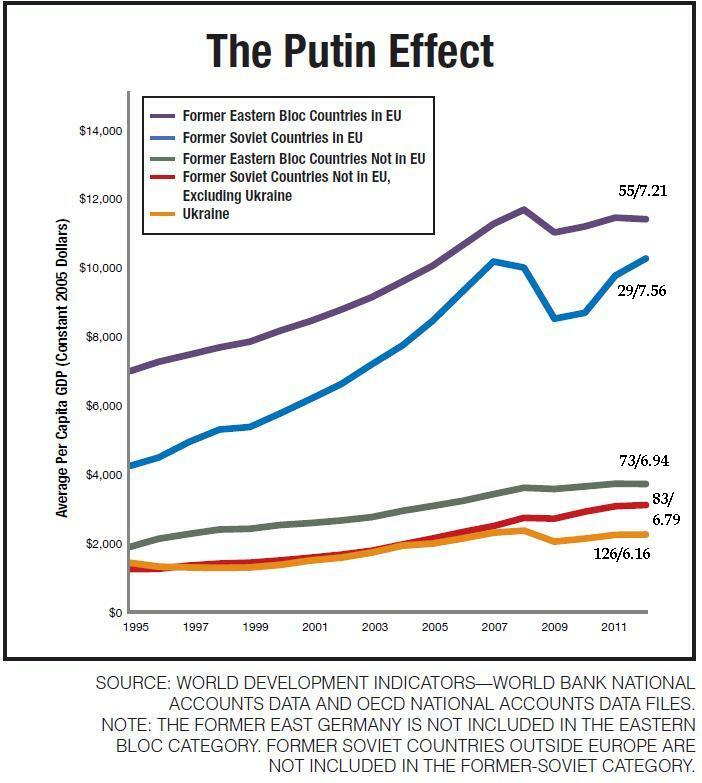 Note that Russia is not broken out a separate line in the graphs that Dan included, perhaps because the author didn’t want the embarrassement or making excuses how all that wealth was just gas sold abroad. I also remember only too well how Russia received accolades from Dan for the 18% flat income tax. One way or the other, merging with Russia would be a dramatic improvement for Ukraine, and mergine with EU does not necessarily mean “economic freedom”. Their farmers are going to get creamed by the agricultural policies, for example. So in a haste to condemn Putin’s policies Dan may have gotten carried away with significant omissions and using junk data and graphs for this article. Hopefully, in the mid terms and in 2016, the US can start the “turn toward the West” again. Really enjoy your daily messages. Ukraine is not practicing Putinomics because of Russia;it is like Russia in many respects, socially and culturally, and it includes the west as well as the east. Hey There. I found your blog usng msn. This is an xtremely well written article. Ned: Good point. Can we convince Russia to annex California and Massachusetts? They’d probably be happier living in a society where socialism has progressed further than they’ve managed to drag the U.S., and what was left of the U.S. would have fewer socialist votes. Russian vote will be overwhelming.